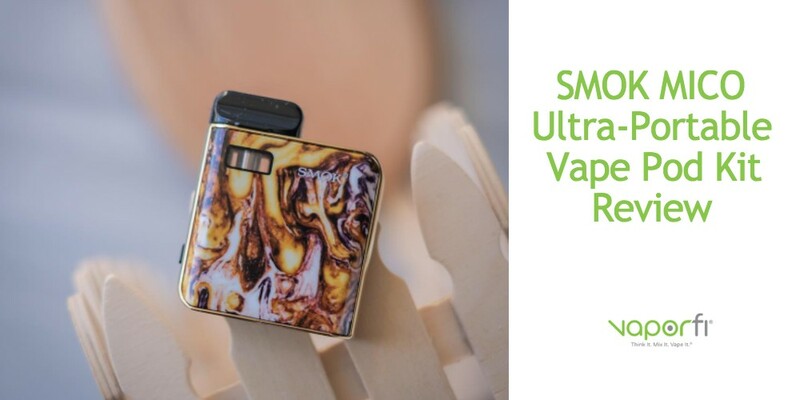 There’s no doubt that SMOK’s latest debut, the MICO Ultra-Portable Vape Pod Kit, seems like a promising candidate for one of the year’s best new vapes. It’s drummed up quite a bit of hype in the vape community, leaving many vapers wondering if this pod-style vape can really live up to its reputation. The VaporFi team decided to try the MICO for ourselves, so we could give you an honest breakdown on everything from flavor quality and vapor production to style and portability. If you’ve been asking yourself, “Should I buy the SMOK MICO?”, here’s everything you need to know about this eye-catching, pod-based vape. True to SMOK’s reputation for style, the MICO is an attractive vape that doesn’t fall short when it comes to aesthetics. The simple square (palm-style) shape is enhanced by gracefully rounded edges, which lend a distinctive look as well as excellent ergonomics. There’s no screen to break up the smooth, simple look of the MICO, with SMOK taking a minimalistic approach with a small LED battery indicator and button-free design. 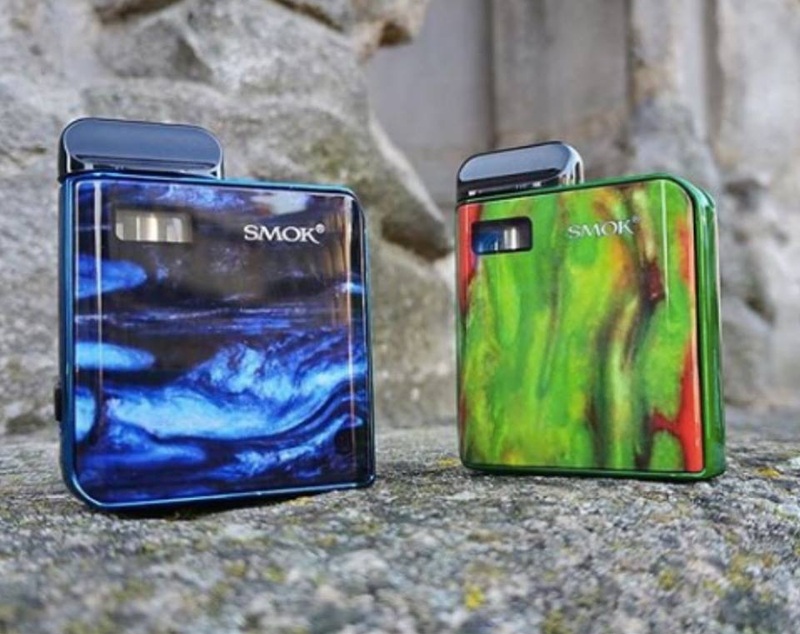 Right away, you’ll notice the gorgeous resin design that’s a signature SMOK style. Choose from several vibrant colorways including a fiery red, deep blue, vivid green, and classic black. 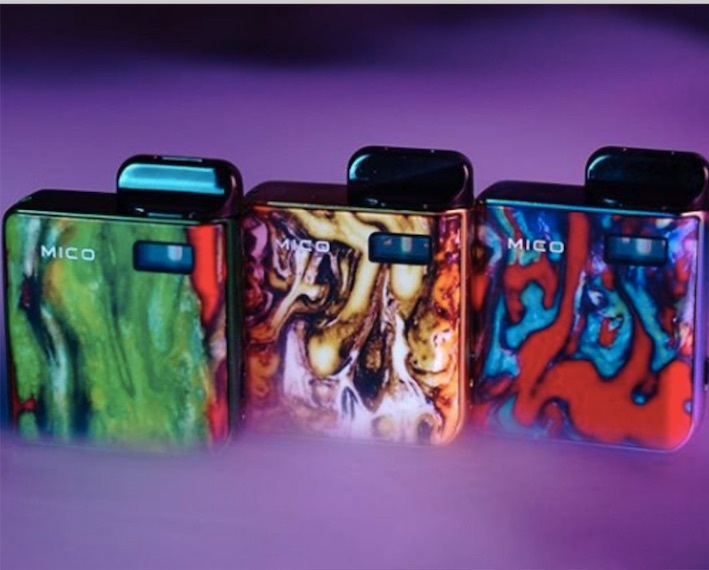 The marble-like look sets the MICO apart from other vapes but doesn’t venture into the too-tacky territory. A useful lanyard is included in the package, adding an element of practicality and easy portability. Another design choice that makes the MICO perfect for on-the-go vaping is its compact size and lightweight design. It fits easily into any pocket or purse, and the zinc alloy construction is durable enough to stand up to everyday wear and tear. This Kit is Ultra Portable! It’s no secret that most pod-based vapes are aiming to be the ultimate in vaping convenience, and the MICO certainly achieves that goal. The refillable MICO pods hold 1.7 mL of your favorite e-juice, using a leak-proof, rubber plug design for fast, simple refills. The top rotary design gives you easy access to the pods, eliminating the frustration of other (less thoughtful) pod vape set-ups. Once you’ve topped off your e-liquid, all you need to do is flip the small side switch to begin vaping. The draw-activated operation puts your required effort at a minimum, simplifying the vape experience in the best way possible. The VaporFi team all agreed that the MICO measured up to other pod vapes as far as usability goes, even beating out others with seemingly small but high-impact design choices. However, we’ve all encountered pod vapes that excel in user-friendliness but fall short in terms of power and performance. We wondered if the SMOK MICO would fall in that unfortunate category – but to our pleasant surprise, it absolutely exceeded every expectation for pod-based performance. The MICO is equipped with a 700mAh internal battery, which is plenty to fuel highly enjoyable vape sessions. Output power can run anywhere from 10 to 26 watts, achieving that perfect balance of power and battery life. While all these factors contribute to the MICO’s enviable performance, where it really raises the bar is its variable selection of premium coils. 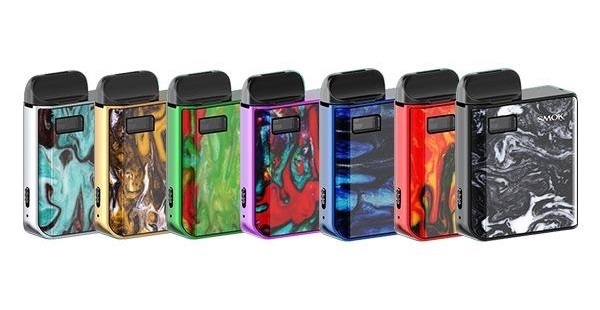 SMOK has created a unique coil structure that defies the pod system stereotype, allowing vapers to customize their vape according to a variety of pod resistance options. The kit comes with the 0.8-ohm mesh coil/pod cartridge that pushes vapor production to new heights, as well as a 1.0-ohm regular coil/pod cartridge that delivers a superior mouth-to-lung experience. You also have the option to swap out the pod for a 1.4-ohm MICO ceramic style. Whichever you choose, the vapor production is solid and the flavor quality is impeccable. Buy the SMOK Mico Now! The SMOK MICO is a serious contender for one of the best pod-based vapes on the market, and it’s absolutely worth the budget-friendly investment whether you’re a pod devotee or just looking to try something new. From excellent performance to quality construction and stylish design, the MICO checks all the boxes. Whether the SMOK MICO is calling your name or you want to keep your options open, you can find plenty of high-quality vape choices right here at VaporFi. Our virtual shelves are stocked with the best brands in the business, offering everything from compact vape pods to high-powered pods for the advanced vaper. Here, you can browse confidently knowing that every product is 100 percent authentic, hand-picked by the VaporFi team for its quality, style, and performance. Not sure which vape products are right for you? Check out our handy vape product guides, where we break down all the best options on the market to make your vape shopping experience easier than ever. 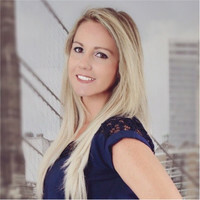 And for answers to all your vape product questions and more, you’re welcome to contact our friendly customer support team 24 hours a day, seven days a week. Get this Mico Pod Kit Now! Have You Experienced This Atomizer? Spotlight on the Vox: 40, 50, 100W!